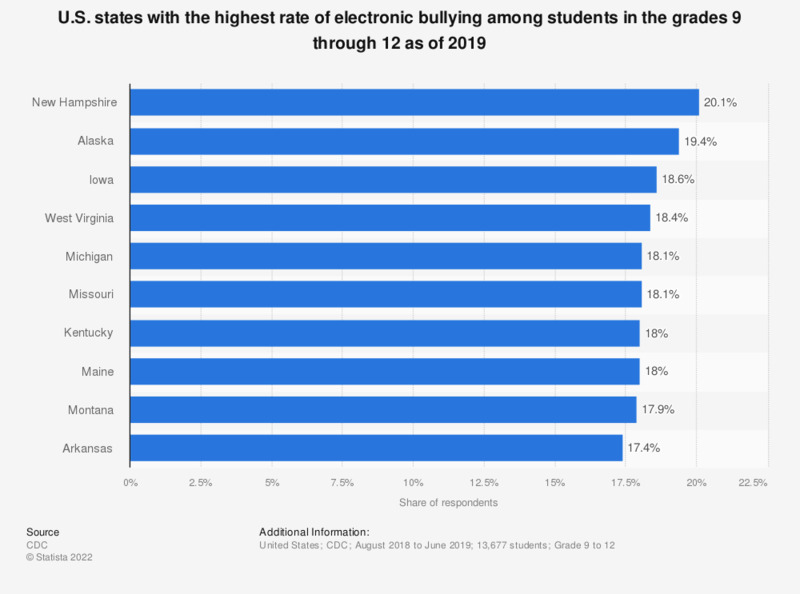 This statistic presents the US states with the highest rates of electronic bullying among students in the grades 9 through 12. During the 2016-2017 survey, it was found that 19 percent of high school students in New Hampshire had been electronically bullied within the past 12 months. This includes being bullied through chat rooms, instant messaging, websites or texting. The U.S. average was 14.9 percent. Everything On "Teenagers in the U.S.: Juvenile Delinquency" in One Document: Edited and Divided into Handy Chapters. Including Detailed References. Which of the following have you ever done in an online comments section with malicious intent towards a stranger? Which of the following behaviors do you think constitute internet trolling? Have you ever been a victim of internet trolling? What would you do if someone made a sexist post on social media? To what extent do you agree or disagree with the following statements on internet trolling?